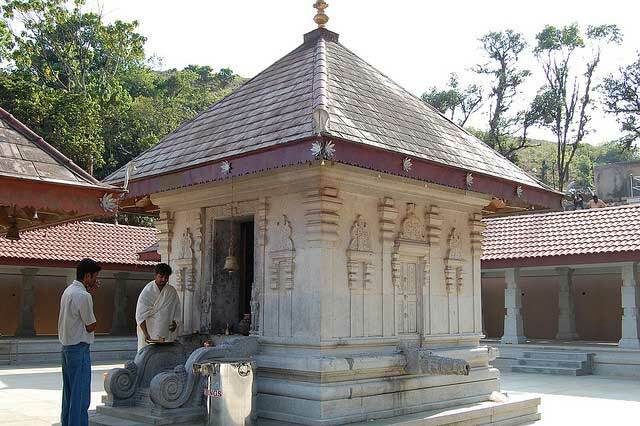 Talakaveri is a temple village located in Coorg; Talakaveri is about 8 km away from Bhagamandala and 48 km from Madikeri. Said to be the place where the river Kaveri originates from, and is located 1,276 meters above sea level. The temple is marked by a small tank or kunda near the hillside which is said to be the origination point, and is dedicated to the deities Goddess Kaveriamma and Lord Agastiswara. The pilgrims often throw coins in the tank and make wishes. The mythological legend has an interesting story behind the origination of this pilgrim spot and denotes the link between sage Agastya and Lord Ganesha. Although there is not a permanent visible flow of water to the main river course, the 1st day of the tula masa month according to the Hindu calendar which usually falls mid October, the water gushes up from the spring at a predetermined moment and is observed by thousands of pilgrims as the fountainhead rises up and is considered a very auspicious site to witness. From here, there are steps that lead to the nearby Brahmagiri Peak where one can get a 360 degrees view of the surrounding hills.